Mint is best grown in containers as it can take over your garden if not kept under control. It prefers full sun to partial shade and likes to be kept damp. Mint dies down in winter and sends up new shoots in spring. Keep the top of your Mint trimmed to encourange it to grow more leaves to the sides rather than growing taller. Pick leaves as required but never take more than one third of a plant. If you are not continually harvesting your Mint, keep the plant trimmed anyway or it will get overgrown and future leaves will be poor in flavour. Due to it’s strong smell, Mint can help keep insects away from other plants and vegetables so it is good for companion planting. There are several varieties of Mint including spearmint, peppermint, pennyroyal, apple mint, orange mint, pineapple mint and chocolate mint. Each is grown for their unique aromas. 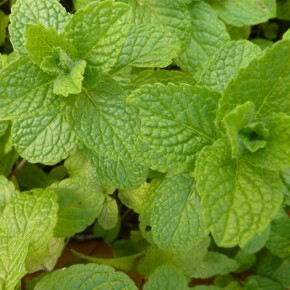 Mint is great in mint jelly or sauce for lamb, iced tea, fruit salad garnish, green peas and yoghurt dips.